Do your kids love to draw? Then, they will love this homemade DOODLE paint! 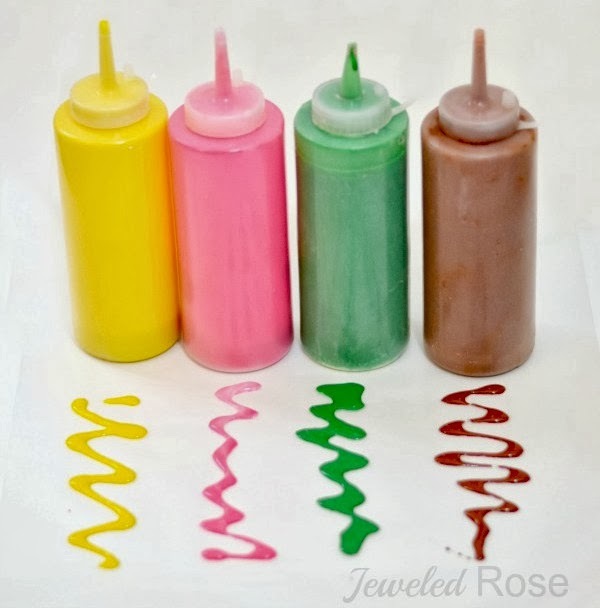 This paint is really easy to make, and there are so many fun ways for kids to use it! The texture and consistency of the paint allows for kids to easily doodle and draw. 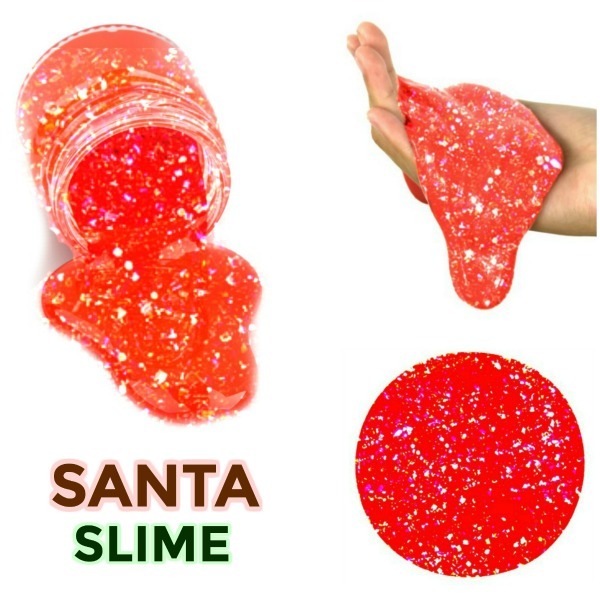 It is fun to squeeze and squirt, and it can be used in other FUN ways, too! 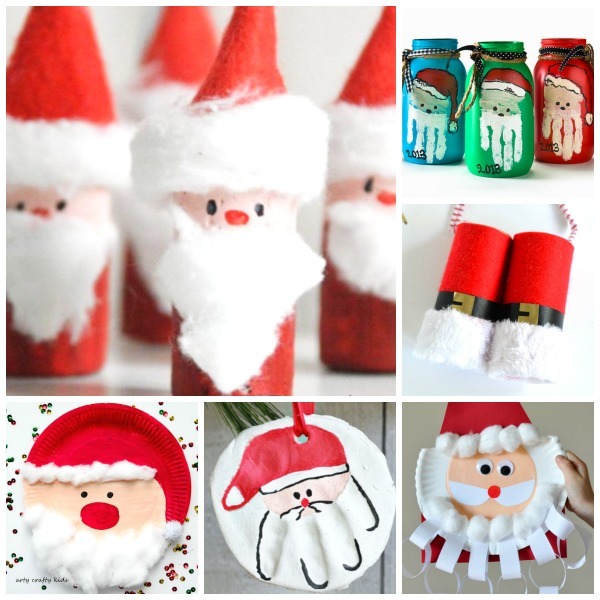 Read on to see how to make your very own holiday DOODLE PAINT. Note: We buy our glue in bulk, so we mixed our doodle paints up in squirt bottles. The bottles we used can be found here. You could just as easily mix these paints up right inside standard size glue bottles; just be sure to use one bottle for each color of paint that you wish to make. 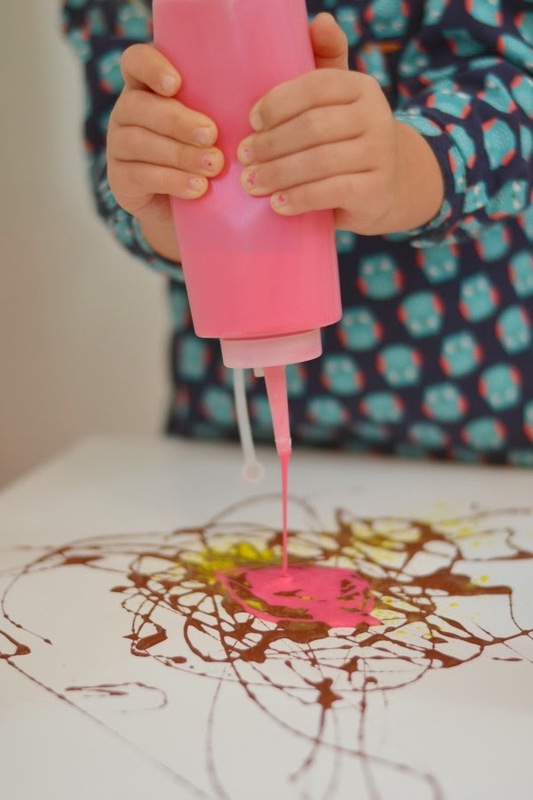 Add several drops of food coloring to a bottle of glue, using one bottle for each variety of doodle paint that you wish to make. Then, secure the lids and shake the bottles to get everything good and mixed one last time. That's it! 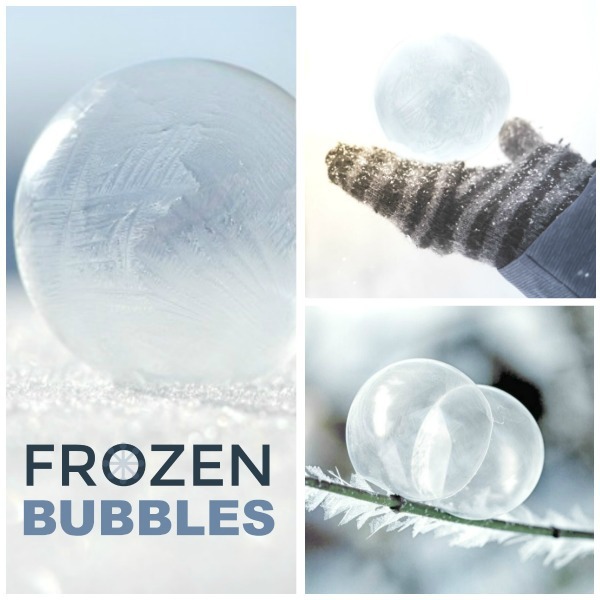 So easy and so fun! Cinnamon paint using red food coloring and cinnamon extract. 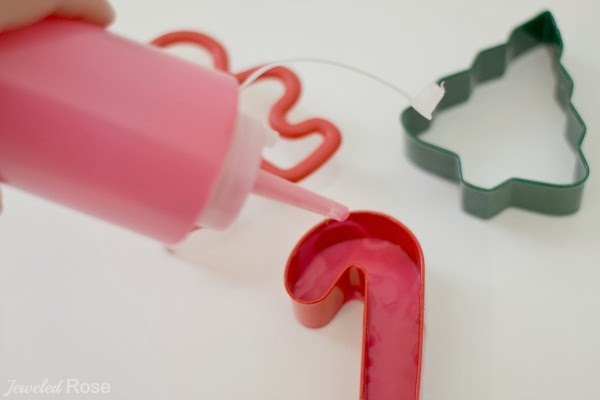 Peppermint paint using green food coloring and peppermint extract. Sugar cookie paint using yellow food coloring and vanilla extract. Gingerbread paint using brown food coloring and gingerbread scent. My girls had a blast with this paint! They loved squirting, pouring, and making designs! Older children can use this paint to draw intricate works of art that will dry hard and raised! 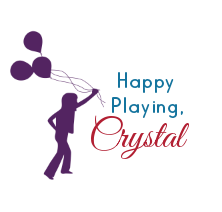 Another Fun Way to Play: Make window clings! 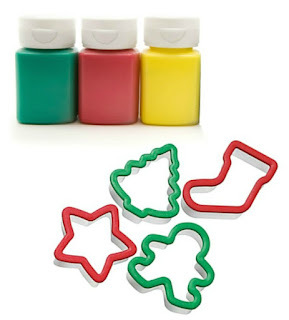 Lay holiday cookie cutters on wax paper, and then have kids fill them in with homemade DOODLE paint. Once dry you will be left with super fun window clings! My girls call these window stickers, and they have had great fun sticking and re-sticking them all over the house. Once the window stickers are dry kids can use the doodle paints to embellish them. My girls loved every stage of this project, and I am sure to cherish my kid-made window clings for years to come! 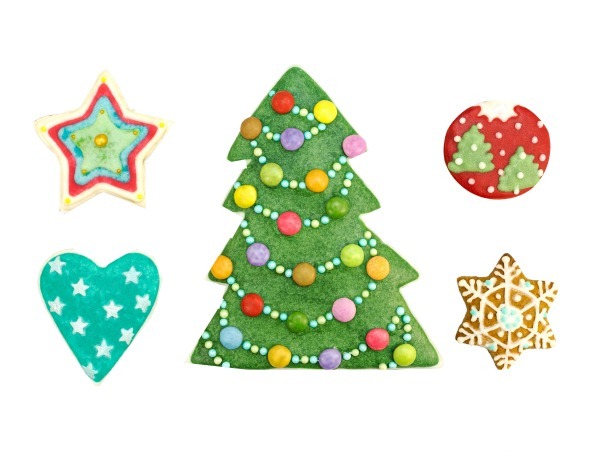 Tips & Storage: The heavier the cookie cutters the better they will work when making window stickers. If glue happens to ooze out you can trim it off of the window stickers once dry using scissors or use the cookie cutter to stamp out the exact design. It will take roughly 24 hours for the window stickers to dry. It is best to buy glue in bulk for activities such as this. We get our glue online here. 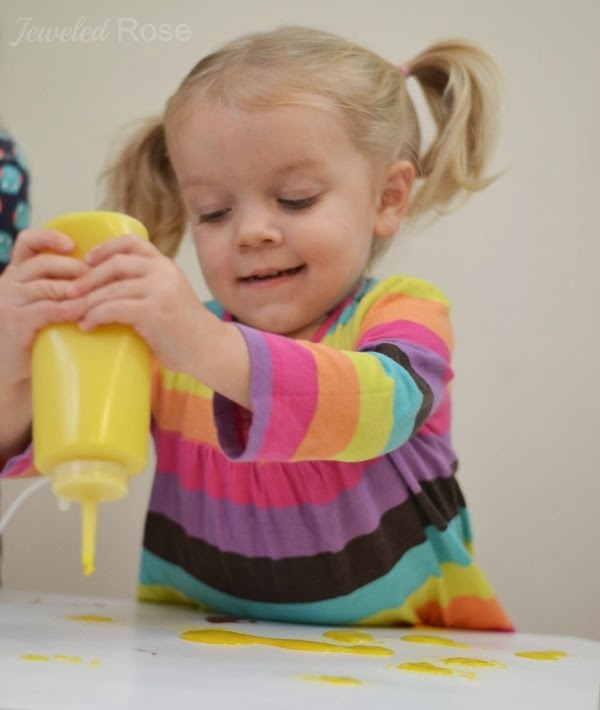 Seal the bottles on your doodle paints between play times, and they can be used again & again!